BY GEORGE ARTSITAS – If you’re going to blame anyone, blame me. It makers sense to blame kicker Alejandro Maldanado, he shtoinked the upright on a potential go ahead field-goal in overtime. It makes sense to blame Chip Kelly, who didn’t trust his kicker and wasn’t able to make any adjustments to get his potent offense rolling. It make sense to blame De’Anthony Thomas after missing a block on Mariota’s 79-yard first quarter run that could’ve been his Heisman moment if he could’ve snuck into the end zone. No, blame me. The first week I failed to make a pick on the year, the Ducks lose. I hate to be vain, but I definitely have a role in this. I had my two siblings in town for last weeks game, sat with them right behind the band in the end zone (by the way, the best place in the stadium to sit. The band is a blast to watch, you get end zone view like a coach’s tape would show and the crowd is raucous. It’s the closest thing to the student section without the fans drooling on you.) I wanted to walk out immediately preceding the last field goal. I knew it was going in. I could feel the collective fans balloon pop right as it went through. I heard people shouting sniper comments about a flag, were’s the flag? All I saw was about 2,500 in the southwest corner of the stadium, all dressed in red, celebrating with their team. This week’s game was supposed to be that for us. A few thousand people, celebrating a win that busts the country wide open. Corvalis was supposed to be ours. This week was supposed to be our victory lap. 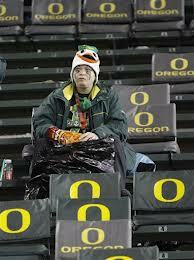 I still think Oregon wins, 63-14, but it just won’t be the same. It never is.